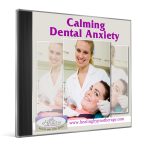 Calming Dental Anxiety for Dental Patients audio is a guided relaxation and visualization to support anyone who is nervous, anxious or fearful while in the dental chair. You will be guided to a very calm and serene place in your mind’s imagination. As you continue to focus and imagine being in that serene place, you will feel at ease and comfortable while any dental procedures are being conducted. As your body and mind experience this deep relaxation and you feel comfortable throughout the entire process, you naturally release old fears and anxiety and find it much easier to visit the dental office regularly.